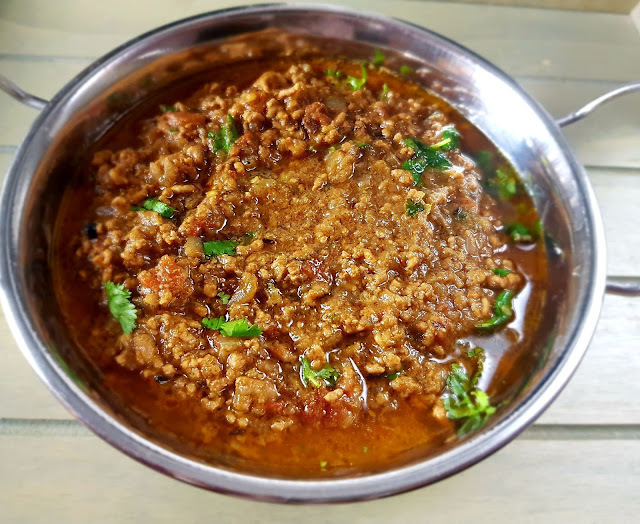 Last weekend Salil decided to make kheema pav. While I watched over the little one, he cooked the kheema, which turned out to be the most amazing kheema I have tasted. I had to get him to remember the recipe so I could make a note of it. This was quite easy as he adapted Sanjeev Kapoor's kheema recipe. :) The link to the original is here. Thank you Sanjeev Kapoor! Usually peas are added too but Salil doesn't like peas so he has left them out (rolling eyes). He also added fresh chillies later after taking out the little one's portion but in the method below I have added them at the start. Heat the ghee in a pan. Add the cumin, black cardamom, cloves, peppercorns, cinnamon stick, mace and bay leaves and fry for 30 seconds. Add the onions and fry for a few minutes on a medium flame, until golden brown. Add the green chillies and ginger garlic paste and fry for 30 seconds. Add tomatoes and fry for a few minutes, until the ghee/butter starts to separate. Add lamb mince and fry until browned (3-4 minutes). Add turmeric powder and coriander powder. Add the water, cover and simmer on a low flame for 20-25 minutes until the mince is cooked through. Add the garam masala powder, mix well and cover again. Cook for a few more minutes. Garnish with coriander leaves.